The following is a chapter I wrote for my friend Janet Fisher’s book, MUSIC HORROR STORIES, (A Collection of Gruesome True Tales as Told By Actual Innocent Victims Seeking a Career in The Music Business) a fascinating, delightful and often instructive collection of experiences of musicians, songwriters and music biz folks about memorable or ugly events on their paths to, umm, fame and fortune. There are 55 stories submitted from all over the world. The book is available on Amazon.com as well as at Janet’s website where you can sign up for Janet’s excellent free music industry newsletter, The Goodnight Kiss Music News. (Goodnight Kiss is the name of her publishing company). She includes pitching opportunities in the newsletter along with great industry info for both beginners and pros. Go to www.goodnightkiss.com for more info about her successful company and projects. While I’m at it, just a few more words about Janet Fisher. I know a handful of indie publishers /entrepreneurs who are as talented, creative, resourceful, aggressive and hard working and fewer with her generosity of spirit. Amen. It was 1960 to the best of my recollection. I’d been working on a bridge repair crew for the Chicago Northwestern Railroad and living with the crew in railroad bunk cars on a siding in a little town in central Illinois called Manlius. I got bored with getting drunk in the only bar in town and asked my mother to loan me her old Sears Roebuck guitar, got a Mel Bay book of chords and taught myself to play. When I started getting good enough and knew a few folk songs I saved my money and bought the new Gibson LG-1 I was lusting for. It was a big year for folk music and I’d really gotten into researching old Appalachian ballads etc. I had worked up enough nerve to go to Chicago’s Old Town district to perform on my first “hootenany,” the equivalent of today’s “open mike.” I can’t remember the name of the club but it either Mother Blue’s on Wells St. or whatever it was called before that. With some trepidation I signed up and waited. The place was packed. The stage was up against the long wall on the right. On the left was a stairway that went to a bar upstairs that also offered a view of the stage below. I patiently waited through several performers until the host began to introduce me. My heart was pounding. As he launched into my introduction he stopped in mid sentence when a commotion started by the door. He said “Hey Bob – ladies and gentlemen, Bob Shane from the Kingston Trio just came in. Bob, come on up and sing a couple!” Shane was drunk, and hilarious for a good ten minutes, sang “Scotch and Soda” and left. I had to follow him. The host was sympathetic, and gave me a nice intro explaining to the audience what a bad spot he’d put this new kid in. I felt shaken but they made me feel like a hero who had just gone through an amazing intimidation ritual and come out a winner. I put away my guitar and took it upstairs to the bar. I sat it against the wall where I cold keep an eye on it and checked it every couple of minutes. Hey, now I was hangin’ and having a little Guinness with my heroes, Bob Gibson , George McElvey, Johnny Brown and the rest of the Chicago folk aristocracy. Very cool, ’til I turned to check on my new guitar again. GONE! Heart stopping panic! Everybody helped – ran into the street – into the back yard – nobody saw it – ever again. Afterwards, I thought “If I had half a brain I’d recognize this as a sign that God didn’t want me to do this.” Now, I’m glad I didn’t listen to myself. If I had, I’d most likely would never have had a life this wonderful. 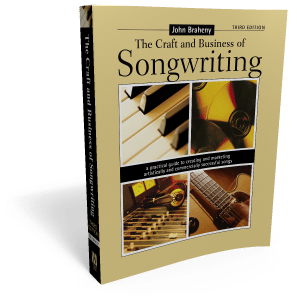 John Braheny continued his career as a solo folk performer for seven years throughout the U.S. and Canada, before he got a deal as a writer/recording artist, started The L.A. Songwriters Showcase with Len Chandler and wrote his best-selling book, The Craft and Business of Songwriting. But those are other stories. John Rhys/John Braheny chat about the late Joe South etc.